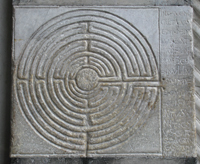 Prominent in both Greek mythology and Catholicism, the labyrinth remains one of the most enigmatic and elaborate structures in history. 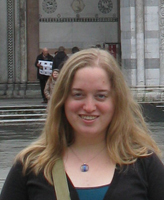 Notre Dame senior Maria Martellaro traveled to Italy and France this past summer in attempt to unravel this mystery for her senior thesis on the labyrinth and its role in late medieval religious architecture. Martellaro’s research abroad was supported by an Undergraduate Research Opportunity Program grant from the College of Arts and Letters’ Institute for Scholarship in the Liberal Arts—and being able to make the trip was a key part of her senior thesis, she says. Martellaro traveled to six cities in all, paying close attention to the connection between the architecture of central Italy and northern France and how it helped propel the labyrinth into a popular design element. Her first stop was Chartres Cathedral in France. 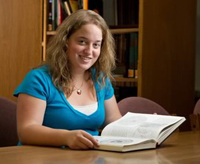 To develop her senior thesis, Martellaro worked closely with Professor Charles Barber and Assistant Professor Danielle Joyner, both specialists in Medieval art history. Joyner contributed greatly in advising her thesis, Martellaro says, while Barber was instrumental in helping her find the right path when it came to choosing a topic. The subject was particularly appealing, she says, because it offered an opportunity to combine aspects of both of her majors: medieval studies and Greek and Roman civilizations. 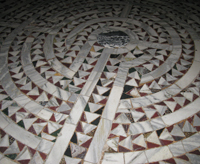 Even more mysterious, Martellaro says, was the religious function of the labyrinth. Martellaro, who used her senior thesis as the primary writing sample in applying to graduate programs in medieval studies and classics, says she isn’t finished exploring the answers to those and other questions about the labyrinth. Originally published by Alex Kilpatrick at al.nd.edu on May 07, 2012.